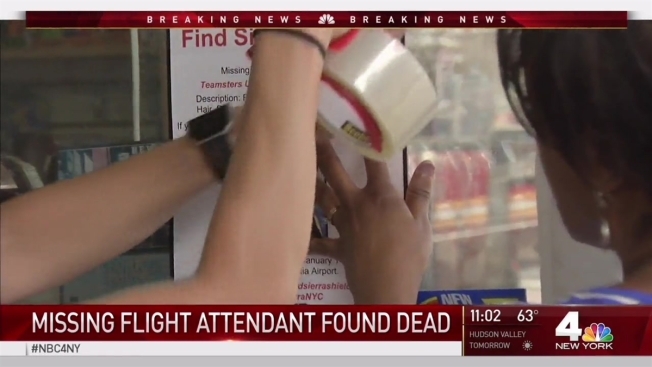 The body of the Delta flight attendant who went missing in January, when she apparently quit her job ahead of a flight and walked out of LaGuardia Airport, has been found, her parents tell NBC 4 New York. Family members had been searching for 30-year-old Sierra Shields since she was last seen walking out of the airport on Jan. 14. Her family says police contacted them and said they found their daughter's remains. It's not clear how she died. During an unrelated briefing with reporters Thursday, NYPD Chief of Detectives Bob Boyce said bones had washed up on Rikers Island, and that "we believe we've identified that female from the clothing that washed up with the bones." Sierra Shields' parents have come to town from Chicago to conduct their own search now that four months have passed since her disappearance. Rana Novini reports. "It appears to be -- and we haven't made an ID on it yet -- from someone who took their own life and jumped in the water," he said. He continued, "That person went missing earlier this year. The clothes that were recovered were very distinctive. We believe we're on the right track, but the OCME has to do their work first." Police said Friday correction offers on the Rikers Island jail complex were training when they found the remains. Shields' family said in a statement Friday, "We are eternally grateful for the outpouring of love and support for our beautiful sweet Sierra. We are truly thankful for how God used Sierra's life to reflect the beauty of His Kingdom. Our family is requesting privacy at this time as we cherish the memory of our precious Sierra." Sierra's mother, Donna Shields, previously told NBC 4 New York her daughter left her apartment in Queens, and like she always did, walked nearly two miles to LaGuardia Airport, where she was scheduled to work a flight originating there. Hours before her scheduled shift, she asked her supervisor if she could speak to her union representative, but the union representative wasn't there. Sierra wouldn't tell her supervisor why she wanted to speak to her -- which was out of character for her because the two were close. Sierra then left her work pass on her supervisor's desk and walked out of the terminal. Surveillance video shows Sierra walking out of Marine Terminal, but it's not clear which direction she went. Police have not released the video, but her family said it only showed about three seconds of her walking. She was wearing her flight attendant dress, but not her full uniform. Her family previously said she does not have a history of depression, and described her as a person who would go out of her way to help others. They fear it was her generosity that may have gotten her into trouble. "My gut tells me she was helping someone," her mother, Donna Shields, told NBC 4 New York in May, when she and Sierra's father flew in from Chicago to look for their daughter. "We don't know who she may have met. She is just... We just don't know. It's hard not knowing," Donna Shields said at the time.